You only ever seriously compare different iPads when you're looking to buy one. Yet throughout their history and many different iterations, the iPad Air and the iPad mini have been a pair. They were so similar in performance and sufficiently different in size that you'd be forgiven for wanting both. Apple may have started off this sense of them being a pair just by how often it released models of the two at the same time. But it's also down to how, for the greater part of their existence, these two represented the very best of what the iPad can be. Today you have the 11-inch and 12.9-inch iPad Pro models which are more feature-rich in every single way other than what can be an eye-watering price. And when the original iPad mini was released in 2012, there was no such thing as an iPad Air. Still, in November 2013 we got the iPad mini with Retina display (later just referred to as the iPad mini 2) and the first iPad Air. In 2014 the updated iPad mini 3 and iPad Air 2 were launched simultaneously, just as they now have been again with their 2019 refreshes. And throughout most of their shelf life, the two models have maintained the same price difference. For $399 you could get the latest iPad mini and for $499 you could get the latest iPad Air. There was also the difference in the physical dimensions of the two, most strikingly in the two screens. The iPad mini has always has a 7.9-inch screen and until 2019, the iPad Air always had a 9.7-inch one. That made an obvious difference to how the two devices looked but it wasn't as clear as one being bigger than the other. For they had the same resolution, which meant even with the actual screens being physically different sizes, they showed exactly the same content. If you like, the iPad mini showed the same content squeezed down uncomfortably. Or, the iPad mini showed the same content with a far sharper display. Both could be true and it was your choice which you preferred. Then there has always been a weight difference which sounds small but feels huge when you use these devices. The original iPad mini weighed 0.68lbs. At the time, the current regular-sized model was the iPad (4th Generation) and that weighed 1.44lbs or just over twice as much. In the next year, 2013, when the iPad mini 2 was coming out with a slightly greater 0.73lbs weight, Apple released the iPad Air, which was 1lb exactly. Now the weight difference between the two was merely 0.27lbs yet still the iPad mini felt substantially lighter because of its size and shape. When you handled the two, you'd think both are light but you'd be certain that the difference is more than it is. Both this original iPad Air and the iPad mini 2 came with 16GB capacity as a minimum and each could be configured when ordering to up to 128GB. They both had the same A7 processor plus the same 5mp rear camera and 1.2mp front one. Then, too, they both had dual microphones and stereo speakers. They both required a passcode to unlock, as opposed to having Touch ID or Face ID. And they both had the same 2048x1536 Retina resolution. The definition of 'Retina' is just that you shouldn't be able to see the individual pixels when looking at a screen from a reasonable distance or angle. It's never been a precise term, but here Apple did push the limits a bit, calling both models Retina when the iPad mini 2 had 326 pixels per inch and the iPad Air had just 264ppi. In 2014, Apple announced an updated iPad mini 3 and iPad Air 2 at the same October event. This time, there was one significant difference in their specifications. The new iPad Air 2 now ran on the A8X processor while the iPad mini 3 stayed on the A7. However, this was the generation that added Touch ID to both models. It saw the rear camera on each move up to 8mp, though the front one remained on 1.2mp. Much of the rest of the specifications stayed the same, too. The screen sizes, resolutions and pixels per inch were identical to the previous models. So were the audio features. The only other difference is that the iPad Air 2 was a fraction lighter at 0.96lbs, a saving of 0.04lbs. The iPad mini 3 remained at 0.73lbs. The 2014 release was the last time, until 2019, that Apple produced an iPad Air. When the iPad mini 4 came out in September 2015, though, that iPad Air 2 was still current. And all that the iPad mini really added to its specifications was an improved processor. It still didn't have the iPad Air 2's A8X processor, but it did have an A8. It also shed some weight, though, and came in at 0.65lbs. That's 0.08lbs less than the previous iPad mini and 0.31lbs less than the then-current iPad Air 2. The iPad Air 2 remained on sale until 2017 when it was replaced by what Apple chose to just call iPad. 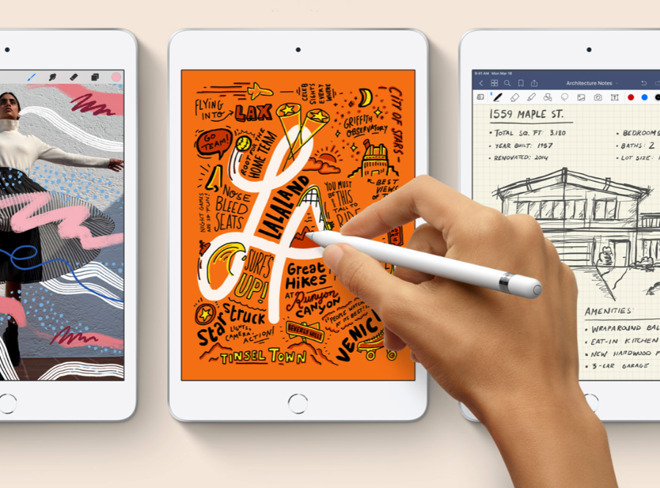 The iPad mini 4 was only officially discontinued in March 2019 when Apple announced its iPad mini 5. Between the end of these two models and their 2019 revival, Apple released no new 7.9-inch iPads at all. Perhaps that was because in 2014 it had finally produced the larger iPhone 6 Plus. While that had only a 5.5-inch screen, it was still bigger than previous iPhones and may have been expected to fill the gap between the phone and the full-sized iPad. There may also have been an issue of price. That 2017 iPad was released for $329, bringing it significantly under the cost of the iPad mini. It had a poorer screen in some ways —the iPad Air 2 had come with a laminated display that also had a greater anti-reflective coating —but that display was also brighter. It had a faster processor, too, with Apple's A9, but its weight went back up to 1.034lbs or approximately the same as the original iPad Air. This price was particularly appealing, though, as Apple had by now introduced the much more expensive iPad Pro models. Starting with a 12.9-inch model in late 2015, the company added a 9.7-inch one in early 2016. 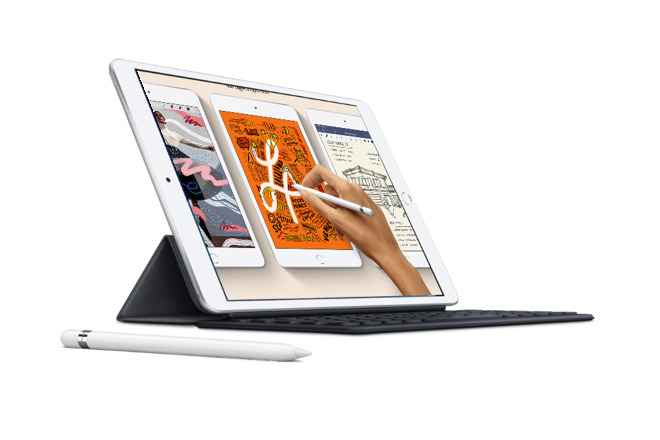 These Pro models have been continuously updated since with the latest versions including a new 11-inch iPad Pro in much the same form factor as all the previous 9.7-inch iPads. Apple also updated the non-Pro model with a 2018 iPad which kept the $329 price. So for the majority of 2018, the iPad mini 4 remained in the range as an increasingly odd option. You had to pay more for it than for a better 9.7-inch iPad so really you were at last paying the premium just for the smaller size. Then in March 2019, Apple revived both the iPad Air and the iPad mini. Fittingly, they did the two simultaneously. Now, once again, you have a choice of a small device at $399 and a larger one at $499. You do also have the iPad Pros starting at $799 and the 2018 iPad remains available from $329. That one isn't looking such a bargain now that its A10 processor is beaten by the A12 Bionic one in both the iPad Air 3 and iPad mini 5. Also, there's still a 1.2mp front camera on the 2017 iPad and both of the newer models come with a 7mp one. If you like the smaller screen then you can now get the very best non-Pro iPad specifications in that gorgeous iPad mini form factor. And if you like a bigger screen, you are now getting an even bigger one. The iPad Air 2019 drops the old 9.7-inch display of every previous non-Pro and non-mini iPad to instead bring you a 10.5-inch one. You can make an argument that the best iPad is the cheapest one, the $329 iPad 2018, and if you only make that case based on the price, you're absolutely right. Regardless of price to performance issues, if you haven't got $399 or $499 to spend on an iPad, that 2018 model is still a good buy. It's just a compromise buy. Similarly, you can easily make a case for the iPad Pro models being the best iPads for every single reason except price. However, yet again, the new iPad mini and the new iPad Air are really the best options. They are the sweet spot in the entire range and it's great to have them back. Check out the best prices for all current iPads in the constantly-updated AppleInsider price guide.